This post is part 4 of a 6 part series. 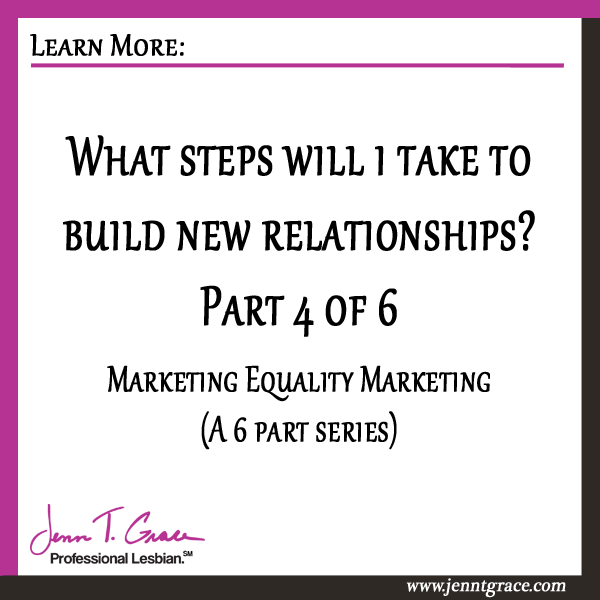 Please read the Marriage Equality is HERE: What does your marketing say about your company? (A special 6 part series) to find out what else you can expect. Here’s one you’ve certainly heard before: “There’s a million other people out there. What makes you different from the person next to you?” it’s a question that’s always relevant, no matter what you’re looking to do! Write a mission statement for your business, something you can go back to and reference when people ask you what it is, exactly, you do. Remember to include not just the activities and/or product of your business, but also what your purpose is, what it is you seek to accomplish and work towards in the long term. Let people know you’re goal oriented and foresighted and they’ll know you’re someone you can work with. Welcome to the age where the first thing anybody’s going to do upon hearing of you Google you! In an enormously interconnected world, encounters and partnerships made online are as important as those off. And remember, starting social media feeds and networks is only the first step. Update your Twitter and Facebook regularly, join new groups and make new connections on LinkedIn, and find ways to attract your readers and subscribers and get them engaged. When somebody takes the time to Google you, make sure you leave them with the best impression you can! Everybody loves a bit of good flattery. 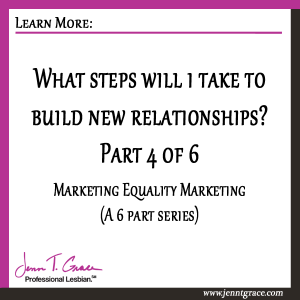 When you go to networking events, approach networks, or do anything involving making new social connections, learn as much about your potential business partners as you can. Figure out their significant accomplishments, their business and network, and most of all, how your goals and their goals align. If you can give people reasons to like you and support you, chances are they will! Any relationship is a relationship of give and take. When you approach nonprofit organizations, pride groups, anybody who can help you get your foot in the door, figure out ways you can work together in a mutually beneficial way. Here I would like to, as I have in the past, emphasize equal rights. Helping out LGBT groups in campaigns to legislate for more equal laws and to raise awareness of problems in the LGBT community are all ways to show that your business is socially minded and trustworthy. Working with your local LGBT Chamber of Commerce is an especially good way to accomplish this, as you can find ways to both grow your business and help the community as a whole! In the next post in the series, we look at ways you can measure your progress and figure out how to plan out your activities on a day by day, week by week basis. If you’ve already read through this and taken the steps suggested, then congratulations! You’ve got the hardest part, finding your way through the door, done. Now comes the longer, less exciting, but just as meaningful process of figuring out how to successively improve your business and your marketing techniques. Hi there – do you remember which post you commented on? When searching for your email I cannot find one in the system showing any comments. Was it under a different email? Thanks.